Habitat: Sandy and rocky soils. The plant is native to North America. Description: Medium - sized, melliferous tree, grows up to 0, 6 meters. Leaves are pinnately compound, bluish green on top, pale underneath. They have a pair of short thorns at the base. Leaflets are oval shaped. Bark is light grey and deeply furrowed. Flowers are small, pear shaped, formed in droopy cluster. Flowering period occurs in late spring, from May to June. Medicinal use: Dried leaves are helpful in treatment of wounds caused by burns. It acts as a pain reliever. Used internally, it calms stomach burns, and is usually recommended to individuals who suffer from hyperacid gastritis and distensions. It is helpful in easing digestion. As a good emollient and expectorant, Black Locust is excellent in treatments of asthma and bronchitis. 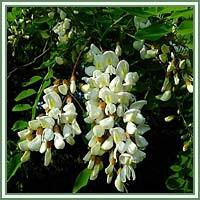 Black Locust has a sedating and calming effect, and could be very useful in cases of headaches and stress. Infusion added to baths can help young children who suffer from insomnia. Flower powder is used in cases of gastritis, duodenal and gastric ulcer. Safety: The plant contains toxalbumin robin, but it loses its toxicity when heated. 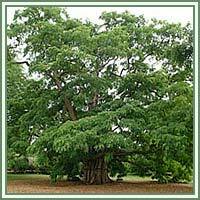 Black Locust could cause allergic reactions. Some herbs could react with certain medication. Therefore, it is advisable to consult your doctor before consumption of any herb.